Failure to conduct a go-around is the number one risk factor in approach and landing accidents and a primary cause of runway excursions. The global aviation industry’s rate of compliance with go-around policies is extremely poor: Approximately 3 percent of unstable approaches result in go-around policy compliance. Improving compliance holds tremendous potential in reducing approach and landing accidents. The go-around itself is not without risk, however, and must be understood before more go-arounds are encouraged and performed. 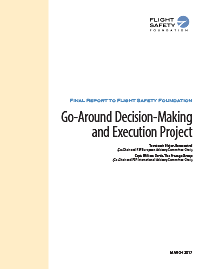 The Flight Safety Foundation Go-Around Decision-Making and Execution Project was launched in 2011 to research and answer the question “Why are we so poor at complying with established go-around policies?” It was also intended to improve our understanding of the risks associated with executing go-arounds and to make recommendations to improve compliance and mitigate risks associated with the go-around maneuver itself. The final report on the Foundation’s Go-Around Decision Making and Execution Project now is available. discuss the report and what it means for the industry in our latest podcast. Click here to access. Additional information on the Go-Around Project is available in AeroSafety World and on SKYbrary.